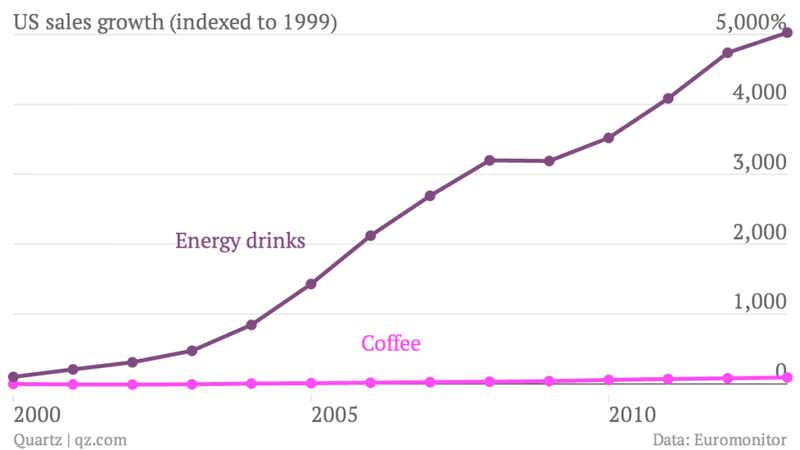 Energy Drink Sales Are Insane, But They Won't Crush Coffee. Here's Why. Here's some news to file under "dystopian future": Energy drink sales are skyrocketing so quickly that analysts are predicting it could replace coffee as America's preferred caffeine-delivery system. But there may yet be some light at the end of the caffeine-tunnel. Roberto Ferdman over at Quartz put together this pair of fear-inducing graphs using data from Euromonitor (the same folks who sounded the alarm on mayo becoming America's favorite condiment). The first graph (top) shows the huge spike in sales growth of energy drinks and the second (bottom) shows how they seem to be on track to catch up to — perhaps even surpass — coffee, where Quartz notes: "It's not unreasonable to expect the two to eventually overlap. Over the next five years, energy drink sales are slated to continue growing at about twice the rate of coffee sales, according to Euromonitor." It's alarming news for coffee fans. But, as utterly confusing as the idea of someone trying a first Red Bull and then going on at some point to actually drink a second might seem, I'm still feeling pretty sanguine about the whole thing. Because, I suspect that the lunch that the energy drinks are eating actually belongs to soda, not coffee. Consider that, while energy drinks may be beating out coffee in terms of sheer growth, coffee consumption hasn't stopped growing at all. Meanwhile soda consumption just hit its 26-year low (this according to data from Beverage Digest, which is both, apparently, a real thing and also a delightful addition to my "puns out in the world" collection). In fact, soda consumption has been on a steady decline since 2005, not coincidentally right around the time energy drinks began their meteoric rise. Does this mean the market for energy drinks and coffee won't overlap at all? Hardly. But my bet is that the larger bite will be taken out of soda's share, not coffee's.